南部の14歳の少年ならだれでも、一度ならず望むときにはいつでも、1863年7月のあの午後2時にまだなっていないという瞬間があり、旅団達はレールのフェンスの後ろに位置し、大砲は森の中に据えられて準備され巻かれた旗が既に進みだすために緩められピケット自身はその長い油を付けた巻き髪で片手には帽子をもう一方には剣を持ちロングストリートが命令を出すのを待ちながら丘を見上げており全てはまだはっきりしていない状態であり、まだ起こっていない、始まってすらいない、始まっていないだけでなく敵陣に対して始めないための時間が残っておりガーネットとケンパーとアーミステッドとウィルコックス以外の人々を深刻な顔にさせる状況が始まろうとしており、我々は全てそれを知っていて、我々はあまりに大きな賭けとともに遠くまで来てしまっておりその瞬間は14歳の少年でもこの時だと考える必要のないものである。おそらくこの時は得るもの全てよりも失うもの全てなのだ。ペンシルベニア、メリーランド、世界、ワシントンの金色のドーム自体が絶望的な賭けに絶望的で信じられない勝利を被せた、賽は2年前に投げられた。 — ウィリアム・フォークナー、 『墓地への侵入者』"Intruder in the Dust"
^ a b Eicher, pp. 544-46. ^ Sears, pp. 377-80; Wert, p. 127; Coddington, p. 485. ^ Symonds, p. 214: "ニューメキシコ州アラモゴードにおける最初の核実験の爆発までの北アメリカ大陸で、最も騒々しい人工の音だった可能性がある。"
^ Hess, p. 162, disputes the two hour duration, writing that the bombardment was essentially over by 2 p.m.
^ Estimates of the guns deployed vary. Coddington, p. 493: "over 150"; Eicher, p. 543: 159; Trudeau, p. 452: 164; Symonds, p. 215: "more than 160"; Clark, p. 128, "about 170"; Pfanz, p. 45: "170 (we cannot know the exact number)." 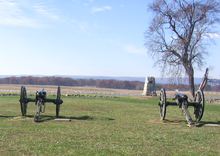 All agree that approximately 80 guns available in the Army of Northern Virginia were not used during the bombardment. ^ Sears, pp. 397-400; Coddington, p. 497; Hess, pp. 180-81; Clark, p. 135. ^ Sears, p. 383. The temperature was recorded at 2 p.m. by Professor Michael Jacobs of Gettysburg College. ^ Estimates vary substantially. Clark, p. 131: 12,000; Sauers, p. 835: 10,500 to 15,000; Eicher, p. 544: 10,500 to 13,000; Sears, p. 392: "13,000 or so"; Pfanz, p. 44: "about 12,000"; Coddington, p. 462: 13,500; Hess, p. 335: 11,830. ^ Hess, p. 171; Clark, p. 137; Sears, pp. 424-26. ^ Sears, pp.422-25, 429-31; Hess, pp.188-90. ^ Clark, pp.139-43; Pfanz, p.51; Sears, pp.436-39. ^ Sears, pp.444-54; Hess, pp.245, 271-76; Wert, pp.212-13. ^ Eicher, pp.547-48; Sears, pp.451-54. ^ Hess, pp.333-35. Sears, p.467. ^ Sears, p.467; Eicher, pp.548-49. ^ Hess, p.326; Sears, p.458; Wert, pp. 251-2, disputes prevalent accounts that Lee and Pickett met personally after the battle. ^ Desjardins, p.47; Sears, p.359. ^ Sears, pp.426, 455; Coddington, pp.504-05. ^ Quoted in Desjardins, pp.124-25. ^ Harman, pp.77, 116; Sears, map, p.427. Boritt, Gabor S., ed., Why the Confederacy Lost (Gettysburg Civil War Institute Books), Oxford University Press, 1992, ISBN 0-19-507405-X. 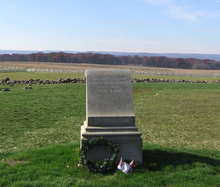 Desjardins, Thomas A., These Honored Dead: How the Story of Gettysburg Shaped American Memory, Da Capo Press, 2003, ISBN 0-306-81267-3. Gallagher, Gary W., Lee and His Generals in War and Memory, Louisiana State University Press, 1998, ISBN 0-8071-2958-5. 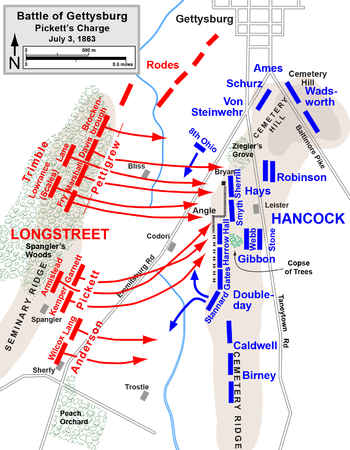 Hess, Earl J., Pickett's Charge—The Last Attack at Gettysburg, University of North Carolina Press, 2001, ISBN 0-8078-2648-0. Gallagher, Gary W., ed., The Third Day at Gettysburg and Beyond, University of North Carolina Press, 1998, ISBN 0-80784-753-4.